Par.1. All assignments are accepted and carried out exclusively by the Dutch partnership (maatschap) Empathy, with the exclusion of Articles 7:404 and 7:407, paragraph 2 of the Dutch Civil Code. Bepalingen uit het Burgerlijk Wetboek uitgesloten van toepassing op overeenkomsten gesloten met opdrachtnemer. Artikel 7:404 Burgerlijk Wetboek: Indien de opdracht is verleend met het oog op een persoon die met de opdrachtnemer of in zijn dienst een beroep of een bedrijf uitoefent, is die persoon gehouden de werkzaamheden, nodig voor de uitvoering van de opdracht, zelf te verrichten, behoudens voor zover uit de opdracht voortvloeit dat hij deze onder zijn verantwoordelijkheid door anderen mag laten uitvoeren; alles onverminderd de aansprakelijkheid van de opdrachtnemer. Artikel 7:407 lid 2 Burgerlijk Wetboek: lid 1: Indien twee of meer personen tezamen een opdracht hebben gegeven, zijn zij hoofdelijk tegenover de opdrachtnemer verbonden. lid 2: Indien twee of meer personen tezamen een opdracht hebben ontvangen, is ieder van hen voor het geheel aansprakelijk terzake van een tekortkoming in de nakoming, tenzij de tekortkoming niet aan hem kan worden toegerekend. Par.2. 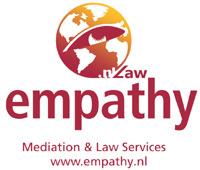 Empathy is a Dutch partnership of private limited liability companies ("professional corporations") and natural persons. A list of the partners of the Dutch partnership will be supplied upon demand. Par.3. Any liability of Empathy is limited to the amount paid in the case at hand under the professional liability insurance entered into by Empathy, increased by the amount of the deductible own risk portion which is not for the account of the insurers according to the conditions of the policy. In the event and insofar as no payment is made pursuant to the aforementioned insurance for whatever reason, every liability shall be limited to an amount of the paid honorarium in the last three months, if the fee charged by Empathy in the matter concerned is higher, up to such amount with a maximum of EURO 100,000. Par.4. Whenever possible, Empathy will consult with the client before engaging the services of third parties, and shall at all times observe due care in its selection of third parties. Empathy is not liable for any shortcomings of third parties. The client authorizes Empathy to accept any limitations of liability of third parties on behalf of the client. Par.5. The client indemnifies Empathy against all claims of third parties, including reasonable costs of legal assistance, which are in any way related to the activities carried out for the client, unless these ensue from gross negligence or intentional misconduct on our part. Par.6. The legal relationship between the client and Empathy shall be governed by Dutch law. Disputes shall be settled exclusively by the competent Dutch court. Par.7. All provisions of these general conditions are made for the benefit of the partners of Empathy, as well as for the benefit of the managing directors of the professional corporations and all persons working for the partnership. Par.8. Unless otherwise agreed, fees shall be calculated on the basis of the number of hours worked multiplied by the hourly rates to be established by Empathy annually. Par.9. Disbursements paid by Empathy on behalf of the client shall be charged separately. A percentage of the fees shall be charged to cover general office costs (such as postage, phone, fax, photocopying). All amounts are exclusive of VAT. Par.10. Any right for a client to put a claim towards Empathy will be expired after one year commencing from the moment the client became aware of such a claim possibility or the client is reasonably expected to came aware of such possibility. The forementioned rights does not have any impact on the obligations of the client to pay any invoice. Par.11. In principle, services shall be charged to the client on a monthly basis, subject to a payment term of 30 days (for clients not situated in the Netherlands) and 14 days for inhabitants in the Netherlands to be calculated as from the date of the invoice. Failure to pay in time entitles Empathy to charge the Dutch statutory interest.